Search All Majestic Real Estate! Majestic Beach Resort is unbeatable when it comes to gulf-front condo living. Not only is this exciting property located in the very heart of Panama City Beach, but it also features superb accommodations and a tremendous variety of resort amenities. 1 bedroom/1 bath – 753 Sq. Ft.
1 bedroom/2 bath (with bunk area or room) – 881 Sq. Ft.
2 bedroom/2 bath – 975 Sq. Ft.
3 bedroom/2 bath – 1197 Sq. Ft.
4 bedroom/3 bath – 1617 Sq. Ft. 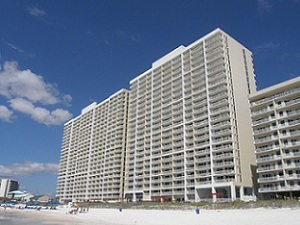 Majestic condos in Panama City Beach are situated in the heart of the action on the lively east end of the beach, within walking distance to many shops, attractions and restaurants. The resort is just minutes from the award-winning St. Andrew’s State Park, and a quick drive to Pier Park with all the entertainment that the west end of Panama City Beach has to offer.